This entry was posted on Wednesday, September 7th, 2011 at 10:10 am and is filed under Scary Monsters: 1980. You can follow any responses to this entry through the RSS 2.0 feed. Both comments and pings are currently closed. Brilliant, isn’t it. seems very buddhist. One of Bowie’s best lyrics, IMO. I remember translating the lyrics to this song for myself one Saturday or Sunday afternoon (dictionary in hand) while War and Peace played on our TV in the background. For some reason this memory has stuck with me. I love the song. It is a bit vicious but everything about it just falls into place. For me one of Bowie’s best songs (along with Ashes & to a certain extent also Fashion) and one that’s proven quite timeless despite (or maybe because) its subject matter. I like the idea of using a Springsteen theme, which Springsteen no longer used and twisting it, Bowie-wise. Springsteen really had exhausted that idea, being too far from teenage-hood to be realistic about it. Leave it to Bowie to abandon realism altogether. Neat trick. I will have to give “Teenage Wildlife” some more listening, given that my usual response is (was) to dismiss it as a catch-all for sound and words and fury, ultimately leading nowhere; a for-real teenage world, filled with wasted hours and metaphorical (and real) suburban culs-de-sac. Scream out aloud as they shoot you down … no no I’m not piece …etc. That gave me teenage goosebumps everytime I heard it. Thrilling. I ind of equate if with ‘Battle for Britain (The Letter)’ though I would struggle to explain why. I’m with Visconti on this one. I was slow to warm to this rambling, seemingly unfocused song. But I always liked the nod to Heroes in the opening riff, and having usually skipped the song in the past, it now feels new and satisfies my new Bowie-material craving. He clearly put a lot into this song and for that reason alone, it is easily appreciated. Wow, yet another great write up of one of the truly greatest Bowie songs of all time. You never cease to impress. One thing bugged me though; I’m not sure that Springsteen has ever seen the inside of a frat house. Otherwise, superb work as always from easily the finest Bowie-themed site on the internet. yes “frat house” was probably too low a blow. just was referring to the party songs on The River (“Sherry Darling” “You Can Look But You Better Not Touch” “Crush on You” etc) that I’ve never liked that much. No no — “frat house anthems” is a perfect way to describe much of Springsteen’s output. Having lived in a frat house in the 80s, I can personally attest to Springsteen’s ubiquity in Frat party mix tapes. Genius song! So many great phrases (lyrically and musically). Like Tony V., it took a long time to sink in for me due to its rambling nature….but it seems too short now! Congrats on another great write up. It is the epic of the album and I have to say I did not like it at all at the time. Nowadays I feel it is the jewel in the crown of the album. It grows with every lesson , Fripp is superb on it as are the other players and Bowie for the first time brings himself into the story without any masks in as others have said the great above quoted lyric. I must try the live links above as I was not aware of a live version. Its a great piece about a star truly aware of himself finally at peace with being an influence but grudgingly offering more hollow riddles than answers…..middle age hit him hard it seems. Youth is wasted on the young. The most incredible thing for me is how bowie is completely aware of being personally cruel to this younger version of himself in the song, therefore blurring the lines between a personal bio song and a viciously impersonal and critical one. On one hand, he describes with great empathy, as a man speaking to (and of) himself, the way this guy is being chased all around like a wild animal; but after he built the poetic image world, his own character in the song denies it. When the protagonist comes to him for advice, saying “they wait for me in the hallway”, bowie pretends he doesn’t know what the guy is talking about. “Don’t ask me, I don’t know any hallways”, as if saying “Have you lost your mind? Nobody’s after you”, then he abruptly leaves the song, allowing the protagonist to be eaten by the predators. I love this song so much that I recorded a cover version of it last week! It was a daunting challenge, as the original is such an epic, but I had fun with it. I suppose I should include a link to my version in case anyone is curious. It’s nowhere close to approaching the genius of the original, of course, but I tried to do justice to the song, at least! Nice cover. Tough song to pull off but you did it well. With Lodger and Scary Monsters, and Low, Heroes and STS still fresh, I always wonder how magical a Tour 80 would have been. And seeing his astonishing performance in the John Carson show, it even makes it more frustrating. Yeah, I’ve often thought about that. I think Lennon being killed put a stop to that. That performance on Carson was one of the finest vocals Bowie has ever done. It sounds like the board is clipping! That band was quite good as well. “I’m still enamoured of this song and would give you two “Modern Loves” for it any time,”….. I couldn’t agree more. I quite like the irony in choosing to play this particular song at a time when he was actively seeking out his musical heirs to repair the damage he had inflicted upon his artistic credibility in the eighties. Remco – Note the interview date. By 2008 at least two generations of his musical heirs had come, and most had gone. He hadn’t recorded/released new material since Reality in 2003, and by 2004 had recovered his cred as (he chuckles wickedly) Godfather of Indie Rock. I did note the date. My appreciation of that quote had nothing to do with the remark about him playing Teenage Wildlife in the mid nineties, which was a period where he definitely needed the extra ‘cred’ Nine Inch Nails and all those people who played at his 50th birthday bash could give him. 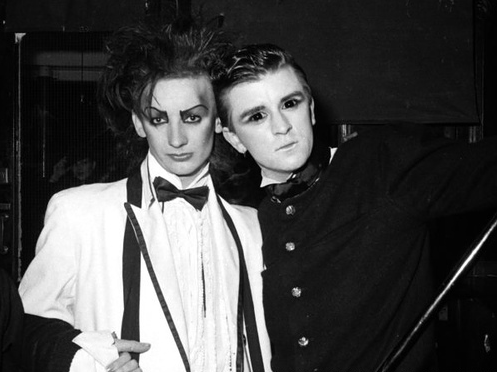 Steve Strange’s eyes look like they were photoshopped. Guess he picked the right name! Well here in the uk Bowie did not need the likes of NIN to to give him extra cred. They and many of the guests he had on his 50th show do not come close to Bowie even at his musical worst….sorry. He is a living legend with a body of work many of his peers would love to have even come close. Even big hitters like Lou Reed pale in comparison …sorry but that’s my view. Let’s face it I’m sure most would agree. Yeah, who was there? Robert Smith – the Cure are ok but pretty one dimensional in comparison to Bowie; Frank Black – the Pixies are brilliant but not his solo stuff; Sonic Youth – great band but one dimensional; The Smashing Pumpkins guy – great first couple of albums but couldn’t stand them after that. Lou’s the one that comes close to Bowie in terms of influence but not breadth of musical styles. Who else was there? Can’t remember, been a while since I listened to the bootleg, which is great by the way – it really was a great gig and Bowie did well out of it even though I agree with DD – he didn’t really need the cred, he hadn’t become Phil Collins or anything, although he flirted with it! Well, I didn’t mean to say any of those guys were better than Bowie but they were considered relevant and exciting at the time, whereas Bowie was in serious danger of being considered obsolete by the larger public. Whether that’s deserved or not is another matter. Looks like I’m going to be the odd one out here. I’ve never been able to like this. It seems to come out far less than the sum of its parts. It’s a shame because it contains some great bits, but they never gel for me. It’s a big disappointment; it works until the line ‘worth more than pieces of gold’. Even the legendary rhythm section seem to plod here. A candidate for ‘Most Misjudged Backing Vocals on a Bowie Song.’. I’ve tried to like it too, but I still can’t get my head around the starting section; it sounds too much like a poor man’s “Heroes”. Brendan i used to feel the same but have really come to enjoy it as it really is quite a brave arrangement and creeps up on you, the lyric is very revealing and for Bowie quite honest ,especially using himself with no diguises in the song. I do think the parts gel after a few listens.The cd is is very muddy though especially the recent vesrsions, get the rca one or the orig vinyl and crank it up loud (like all the album it benefits from volume) and listen to it soaring on the Fripp licks….superb stuff. Believe me I’ve tried. Every time I play it, it tricks me into believing it’s going to be great ‘this time’. And then those backing vocals kick in… there are times when it trespasses on MeatIoaf territory. However, I do think there’s a great song in there somewhere. It took me a great long time to like the song, too: it took listening to it again for this project to really get me to enjoy it. But as I said, it’s a tough, weird, overlong song. The backing vocals are a good point, a case of a classic DB impromptu decision (hey, why hire professionals? just get the engineer and a friend of yours to sing) not really working. I like the “amateur choir” much more on “Up the Hill Backwards”. Mmm I quite like the amatuer backing vocals they add a touch of freshness to it if you know what I mean. Meatloaf?…..nah no way. I would now put this as an epic. Its not long enough for me. I soon tired of the hits on here. Wildlife was ok live as well though I’m not fond of gabrels playing. To van halen. Try listening to it drunk, particularly if you’ve just gone through a breakup – it’s great therapy and makes perfect sense. Play it loud and on vinyl of course. I’ve never noticed anything wrong with the backing vocals. It’s not the execution of the backing vocals, it’s the conception that annoys me; they’re everywhere. If not Meatloaf, then it reminds me of something like Cygnet Committee, where he aims high, doesn’t hold back in his ambition, yet just misses his target. A more detached producer might have helped. On the touring point, if you listen to that BBC interview a few days before Lennon is killed, it’s clear that touring does not appeal to him at all. It took me a bit to fall in love with TW too. Now it’s in my top five bowie tracks of all time. Yeah, I’d say that setting you find yourself in right now might not be conducive to “getting” it…maybe come back to it at another time, maybe at a time when you are going through a hard time with something. Then, all of a sudden, it just suddenly…changes. Oh, and Cygnet Committee is brilliant! I LOVE the backing vocal on this one. Yes you’re all alone in the world. Blasphamy sir …cygnet is superb its everthing that is great about Bowie and stop bragging about sunshine in blighty its miserable LOL. Its very much in the vein of cygnet,quicksand,sweet thing ambitious and wordy filled with images a case of the words being far more important i feel than the music if you know what i mean.Perhaps one day an acoustic stripped back version will appear. Good read. Thanks. I played the track three times whilst I read it. One telling thing for me about this nearly seven minute song was that I was never alerted to its length until I had a car with a CD player that displayed the track time of the cut. I was shocked to see that this song I had been listening to for 27 years was in fact 6:55. It sure didn’t feel like that to my ears. 5:30 maybe. I was under the impression (mistaken?) that this lyric was specifically yet another shot across Numan’s bow rather than just a sign of Bowie’s general feelings toward his heirs apparent. Pretty much from “teenage billionaire pretending it’s a whiz kid world) on. This is the song which made me get into Bowie more than a casual listener. It is my favourite song of all I think, it is absoloute perfection. It is so clearly full of experiment that it makes it alive with every listen, the lyrcis I find incredibly inspiring, although they make you aware of what Bowie knows can go wrong. Id give you 500 modern loves for it, and Fripp played guitar like a wizard. Agreed. I loved this song since the first time! Its finest structure, so many stamps and colours. That magical refreshing clean Fripp solo. Wow, comments here are as interesting as the write up on the song itself. I’ve only recently discovered the flipside of Scary Monsters for myself (as a kid my older brothers would only play the A side) and I have to say Teenage Wildlife is a stand out track, as is the cover of Kingdom come. Scary Monsters is a weird album, the second side really feels like a pre-ambient / post- Roxy music Eno record with no Eno, but with Bowie doing crazy vocals (and various impersonations ) instead. It was always my favorite song on the album and one of my favorite albums by Bowie. The backing vocals are brilliant. The alternate mix is fascinating. The places where Fripp was muted leave room for more vocal detail and sounds possibly better to me than the final mix. I bought this record when it first came out and it has aged well. The Berlin period is my most loved material and this seemed like the perfect finish of those ideas- even with Eno elsewhere. This site is fantastic.